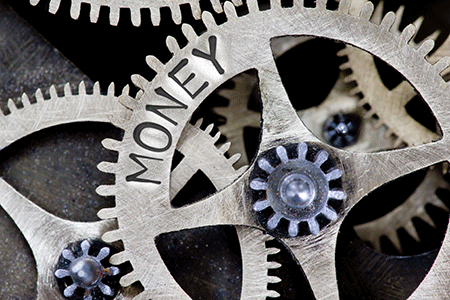 In this article I am going to share with you some concepts that will show you how to profit from investing in the stock market so you get the results you desire much sooner than you otherwise would. I will also introduce you to a simple but powerful technique that will allow you gain confidence in how you can consistently make money when trading the stock market. Over the last 15 years or so I have spoken to many people who have a desire to invest in the stock market so they can retire sooner, create a passive income to live the lifestyle they desire or to take control of their superannuation nest egg. No doubt, there is a common theme among all of us about wanting to achieve our financial goals. But the amount of money you make from trading the stock market is determined by the time and effort you are prepared to put in and the type of education you gain in your trading journey. I often hear people say that they would like to learn to trade but they’ve heard stories of those who have spent hours in front of their computer only to achieve mediocre returns and, therefore, leave it up to the so called professionals believing its all too hard. The unfortunate reality is that a lot of people have been misled into believing that lagging indicators, such as moving averages, Bollinger bands and other computer generated indicators work best when trading the stock market. But while these techniques appeal to the masses, given that they are perceived to be simple and easy, they don’t necessarily make you a lot of money. In fact, lagging indicators make brokers a lot of money because they whip saw you in and out of trades repeatedly, and overtime most traders fail to profit consistently when using them. However, would it surprise you to know that the most skilled and successful traders do not trade this way? Instead, they use leading (or predictive) indicators that allow you to enter the market at the earliest possible indication of a change in trend, which we discuss later in this article. So let me ask you, why would you want to trade more and make less when you can do the opposite with minimal risk if you have the right knowledge? What is your education costing you when it comes to investing in the stock market? Watching videos on YouTube or reading books may seem easy but in reality, all you really gain is a little bit of information and very little education. While learning this way is cheap, what does it really say about your mindset when you trade the stock market? Think about it, if you want to make serious money from the stock market, which is very achievable, why would you spend almost no money or a couple of hundred dollars on books believing this will guarantee your success? Benjamin Franklin got it right when he said, “an investment in knowledge pays the best interest”. Ask yourself, what is your education really costing you in terms of lost opportunity and lost profits? Let me give you an example. If you invested $1,000 over 10 years with no extra contributions and achieved a 10 per cent compounded return, your return on investment (ROI) would be $2,707 or a 270 per cent return on your capital. But if you learnt how to achieve a 20 per cent compounded return, your ROI would be $7,268 or a 726 per cent return on your capital. Now imagine you have $10,000 invested at a compounded return of 20 per cent - your capital would have grown to $72,683. No doubt, you are starting to get the picture of what it is really costing you not to get a solid education. Now ask yourself, how serious am I about learning how to profit from investing in the stock market and what am I prepared to do to learn the techniques that can double or triple the returns I am currently achieving? Believe me when I say your education will cost you in one way or another. 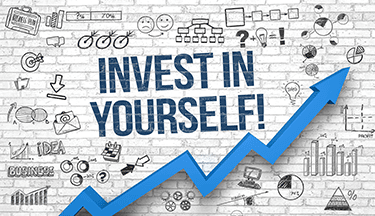 But if you invest in yourself to learn how to increase your probability of success and, in turn, reduce the negative impact of your psychology, which few traders place a high priority on when trading the stock market you will be able to achieve your financial goals. Find someone to teach you who is qualified and has mastered the techniques. There is no substitute for a quality education, as it will dramatically increase your success and reduce the timeline required to achieve your goals. It is never too late to get the right education and remember, it’s just a decision. 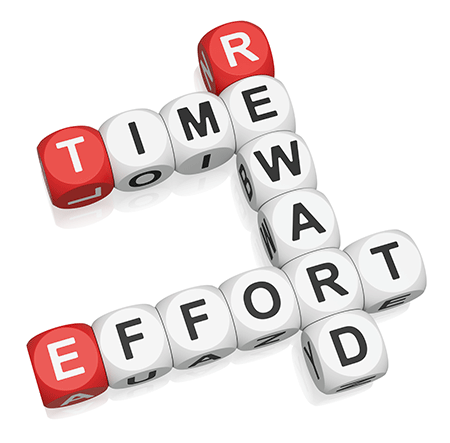 Once you’ve made it, you will find the time and money you require to achieve your goals. Observe what successful traders do and then apply the same techniques and processes. You need skills based, structured learning with exercises that allow you to demonstrate you understand and can apply the techniques appropriately. You must be able to check your answers, otherwise how do you know whether you have interpreted the application correctly? As with anything you learn, repetition is the key. Get the application right and you will build your confidence. This is critical to your success. Prove you can consistently apply the trading techniques in any market condition using historical data. Most people get into the market without doing this first and end up testing their psychology before they trust what they are doing, which is to their detriment. This has a spiral effect on a trader’s psychology and costs them more than they realise. Stay away from daily charts when learning how to trade stocks. You are far better off testing your knowledge and skill on weekly charts. With experience, you will find that you were wasting your time and money by putting so much focus on daily charts, which unfortunately is where most people start out trading. You need a mentor or coach to ask questions and check your work as you gain the knowledge. This also acts as insurance as it saves you time and money. A good mentor will help you to learn and trust the techniques, as well as cut out a lot of time from the learning process, while at the same time helping you to avoid costly mistakes. Think of the potential value that can bring as your mentor will help you see what is missing in your trading. So now let’s consider just one of a number of important trading rules all traders should have in their toolkit, unless they want to end up in the school of hard knocks. Trading is not about being right 100 per cent of the time - it’s about knowing your probability of success. You will have both losing and winning trades, but the goal is to determine a trading strategy that provides more winning trades or a higher probability of success. One of the simplest and best trading techniques that is often overlooked by traders is Dow Theory. It is for this reason why we teach it in all of our courses, from the Trading Mentor Course to the Diploma of Share Trading and Investment. Dow Theory is a short to medium term indicator that allows you to enter and exit trades at the first sign of a change in trend or confirmation of a continuation in an existing trend, which is why it is considered a leading indicator. Put simply, this theory presents opportunities to get in and out of the market several times as the trend unfolds so as to protect your profits. When using Dow Theory to enter a trade, you would buy on confirmation of a higher trough, followed by price rising $0.01 above the previous peak, while a sell is confirmed by a lower peak followed by price falling $0.01 below the previous trough. So let’s look at an example. On the weekly chart of Bellamy’s, below, you can see the stock formed a low in April 2016 before rising the following week. It then fell for one week prior to a Dow entry at $10.49 in May 2016. 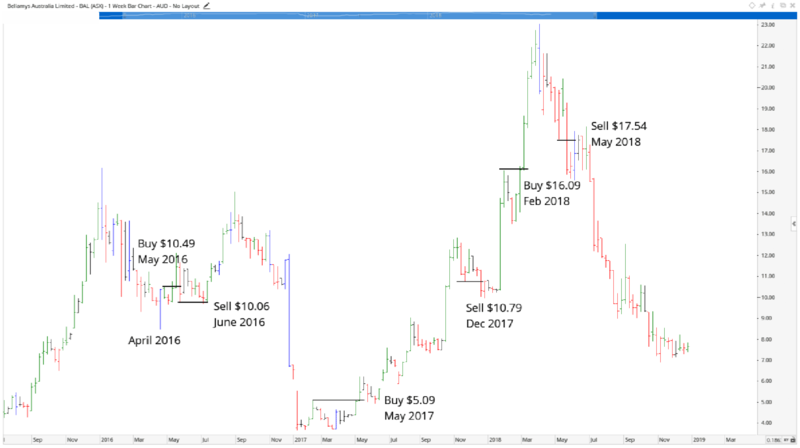 The stock then reversed shortly after to trigger an exit at $10.06 in June 2016. Although we exited at a loss of 7 per cent, it was only small and we were able to protect our capital given that following the exit the stock fell heavily. The second entry occurred at $5.09 in May 2017 with the exit triggered at $10.79 in December 2018. Obviously, this trade was worth the wait given that it achieved a profit of around 112 per cent. The third entry was triggered at $16.09 in February 2018 with the exit occurring at $17.54 in May 2018 resulting in a small profit of 9 per cent. Are you starting to appreciate the low risk nature of this strategy? Unfortunately, too many traders are focused on trading short term using daily charts and, consequently, fail to see the bigger picture of what is actually unfolding on the weekly chart, which is far more profitable and much less work. And it allows you to simplify your trading. In essence, Dow Theory allows you to trade with the direction of the trend, which is why this technique is so effective. As you see in the chart above, the last exit in May 2018 demonstrates how using Dow Theory can protect your capital against significant losses. This brings me to one of the most important factors in becoming a successful trader. It is not how much money you make over time that is important, it is how much you do not lose that will determine your long-term success. Would it surprise you to know that if you held Bellamy’s from the first entry to the present, you would be sitting on a loss of around 27 per cent. But as you can see, by applying a simple strategy, such as Dow Theory you would have made over 100 per cent on your capital and more than doubled your initial investment. Now that you have a basic understanding of how to buy and sell using Dow Theory, you need to practice this skill so that you become comfortable identifying the signals. You also need a trading mentor because as I previously mentioned there is no substitute for structured training when it comes to investing your hard earned money in the stock market.